We have a special sail planned this year for Earth Day! This sail is being done in conjunction with docents from the Marine Mammal Care Center and the International Bird Rescue as our part of the City of STEM celebration in Los Angeles. During our two and a half hour sail they will share their knowledge of the local seashore fauna and experiences in rescue and rehabilitation. Get answers to all your questions about the local wildlife and the challenges to our local environment from experts in the field! 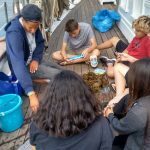 The Los Angeles Maritime Institute (LAMI) is proud to celebrate the disciplines of Science, Technology, Engineering and Math, and have formed our organization around our tall ships as a floating classroom providing a unique and engaging learning environment. We provide these sails both as educational experiences for all ages and to fund our proven youth education programs at sea. 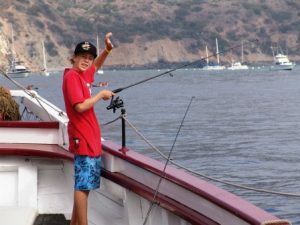 Your ticket purchase helps fund these programs and offers a glimpse the the fun activities we do on board our vessels. 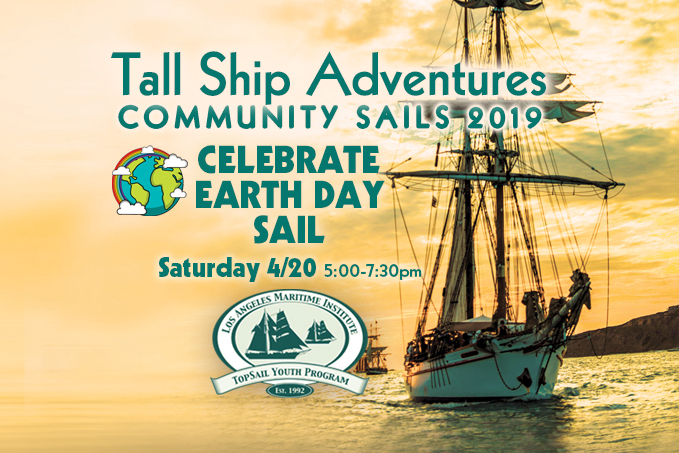 Sail is April 20th, 2019 from 5:00pm to 7:30pm. Two Sweetheart Sails this Year! So Much Love! A Sweet and Savory Sail with our Valentine Sweeties! Join us for a Sunday afternoon sail with a number of sweet and savory delights along with tea, coffee, and hot chocolate. The perfect way to treat those special Valentines in your life! Seating is limited, so reserve your spot early. Proceeds benefit our TopSail Youth Program. Our tall ships are docked at Berth 84 at the foot of 6th Street near the LA Maritime Museum in San Pedro. Be sure to allow plenty of time to find parking – weekends are busy! You may bring your own food and beverages on board (wine permitted), but pack light and be as environmentally friendly as possible. Layered clothing recommended as it can get windy on the water. We are a non-smoking vessel. 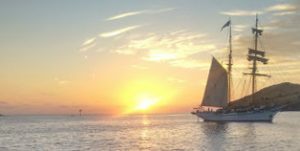 Tickets are non-refundable and in the event you are unable to sail, your ticket will be considered a tax-deductible donation to the TopSail Youth Program. 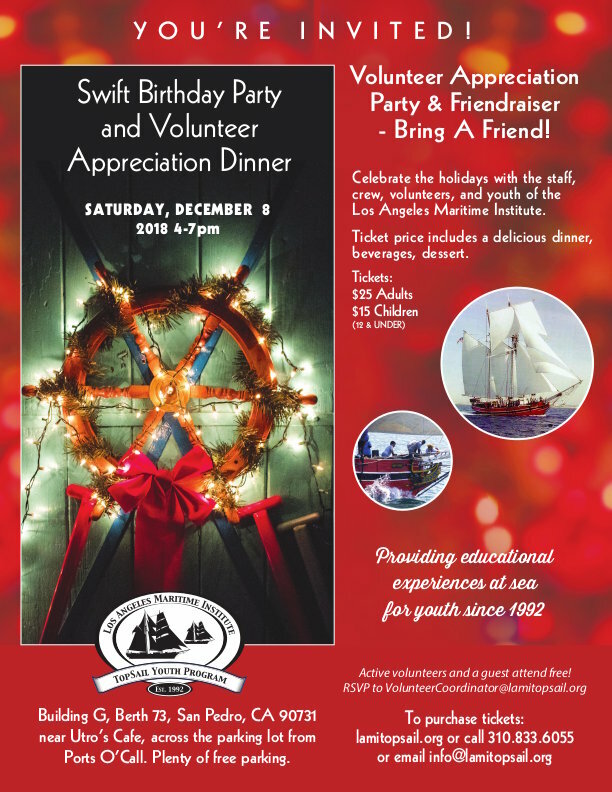 Los Angeles Maritime Institute is a 501(c)(3) nonprofit organization. We are not connected to any government agency and are solely dependent upon financial support from foundations, corporations, and individual donors to keep our life-changing program afloat. Please join us for a sail and a celebration of all the things we are thankful for. You can sit back and relax or become part of the crew – your choice! Departure: Please arrive at 4 pm for check in. Things to Bring: Something warm (sweater), and food or beverages of your choice. To order tickets call us at 310-833-6055. Free deck tours and the best place to take your Halloween selfie! 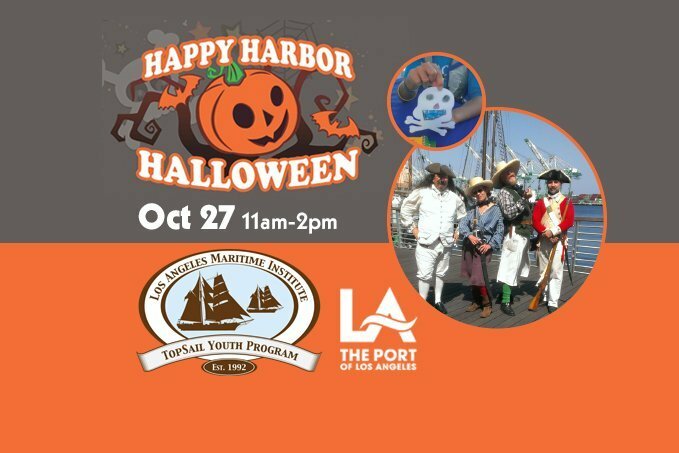 Come meet the crew and see the Exy Johnson at the downtown harbor cut in San Pedro, adjacent to the Los Angeles Maritime Museum. When: Saturday, October 27, 2018 from 11am to 2pm. One Saturday per month, beginning May 20, 2017 at 4:00pm, Los Angeles Maritime Institute invites you to join us for a coastal awareness educational experience and exploration sail aboard one of our tall ships. The ship departs from Berth 78 in San Pedro’s Ports o’ Call Village for a 3.5 hour round trip excursion along the Palos Verdes coastline. Our goal is to raise environmental awareness that leads to personal action to reduce marine plastic pollution and human impacts to our local coastline, along with its marine organisms by engaging bilingual (Spanish) materials and trained bilingual docents. The sails will include on-board, hands-on, and scientific activities. Families and children welcome! All minors must be accompanied by an adult, and children must be 12 years or older. For further information call 310.833.6055. ¡Explora la costa en un barco! ¡Gratis! El Instituto de Marítima de Los Ángeles en colaboración con Conservación de la Costa los invita a disfrutar de una experiencia costal y paseo en un barco de 110 pies de altura en una excursión de ida y vuelta de tres horas. El barco sale del puerto de O’Call de San Pedro, un sábado por mes de las cuatro de la tarde y navega a la costa de Palos verde y regresa a las siete de la noche. Nuestro objetivo es ofrecer conocimiento ambiental que lleve a individuos a tomar acción personal y reducir plástico en la marina y contaminación en los drenajes e impactos humanos a nuestra costa local y organismos marinos. La excursión tendrá presentaciones en español e inglés e información gratis con guías bilingües. Habrá exploraciones y actividades científicas para familias y niños. Todos los menores de edad tienen que estar acompañados por un adulto y niños tienen que tener 12 años o ser mayor de12 años. Vaya a menú de “Como aboard”. Inscríbase en Explora la costa (Explore the Coast). Escoja un día específico para su excursión. Si prefiere, llámenos al 310.833.6055.